Skywalker, aka PA's Sky Walker, is a 10½-year-old white and brindle male born on January 26, 2004. His sire is TNT Star Wars and his dam is Oneco Reflection. Skywalker has 134 races on record at Greyhound-data.com, starting on September 7, 2005 in Southland in Arkansas and finishing on September 6, 2007 in Daytona Beach, Florida. Skywalker's previous owner was arrested on drug charges in AR. He was picked up by the animal shelter at that time, and nobody came to claim him. 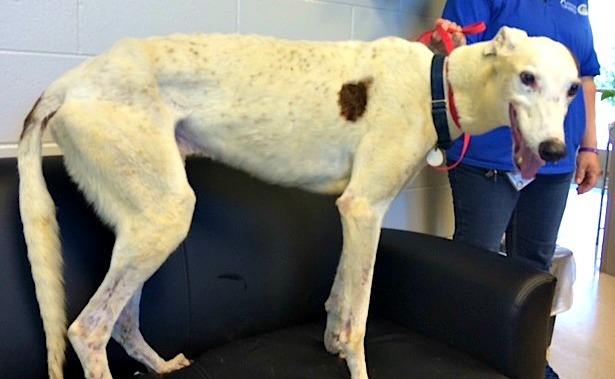 He had been horribly neglected - he was very thin and his teeth were in terrible shape. Most of his teeth were extracted during his dental cleaning. Skywalker has passed an initial cat test with flying colors.